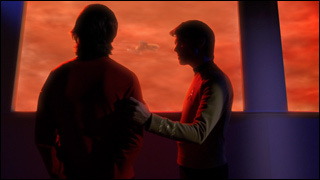 TrekMovie.com, the leading Star Trek news site, has awarded the Star Trek: Phase II episode “Blood and Fire: Part 2” the Best Fan Production of 2009! Congratulations to James Cawley and all entire Phase II staff. Runic Films’ Carlos Pedraza co-wrote the teleplay with noted science fiction author David Gerrold (“The Trouble with Tribbles”). Gerrold directed the episode with other Runic members David Berry, cinematographer, Joël Bellucci, visual effects supervisor and Ben Alpi, second unit director. “Blood and Fire” is based on a script Gerrold wrote for Star Trek: The Next Generation but was never produced because producers deemed it too controversial. An emotional yet exciting story, complete with the excellent production values and effects that we have come to expect from the Phase II team. The past year also attracted kudos for Carlos’ and Runic member’s work from Joss Whedon, who told Rolling Stone that the Phase II episode, “World Enough and Time,” which Carlos Pedraza co-executive produced, inspired Whedon to create the Internet phenomenon Dr. Horrible’s Sing-Along Blog. Berry, Bellucci and Alpi contributed to the episode in production, visual effects and distribution. Rolling Stone, by the way, named Phase II, among its five must-watch Web series. “Blood and Fire” is based on a script Gerrold originally wrote for Star Trek: The Next Generation in the 1990s. It was never produced because its passing reference to a male couple aboard the Enterprise was considered too controversial by the producers. Fortunately, Part 2’s release this past November was greeted by far fewer objections. Watch both episodes of “Blood and Fire” and all the Phase II episodes on the Phase II website.